Big news on the tour front...I'll be coming to a city near you VERY VERY SOON. 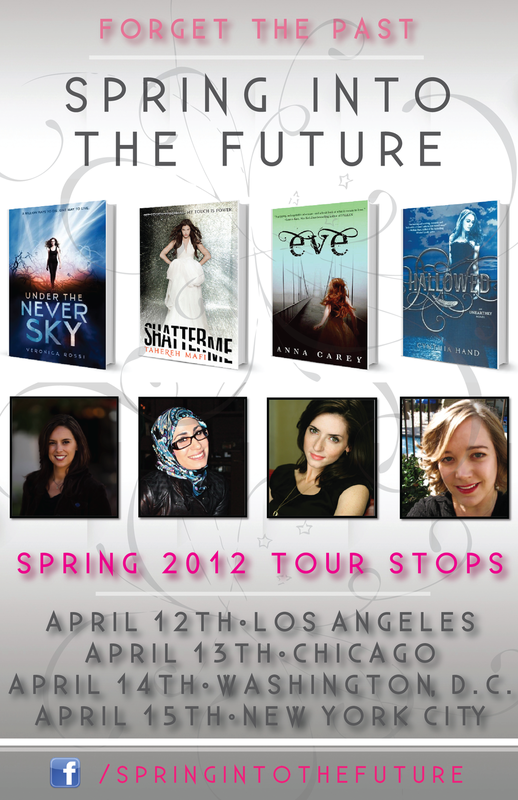 In the beginning of April I'm heading out with Tahereh Mafi (Shatter Me), Veronica Rossi (Under the Never Sky) and Cynthia Hand (Unearthly, Hallowed) to sign books, talk apocalypses, and cause general YA mayhem across the country. This is only the first leg of the Spring into the Future tour, so be sure to check back for details. We'll be heading out in May as well, touring the Pacific Northwest (Seattle, San Francisco, and Portland). PS: LOVERS OF FREEBIES: Starting this month, we'll be giving away "Spring into the Future" tote bags, stocked with signed copies of our books, as well as some highly coveted ARCS of next season's hottest titles. Like the facebook page to stay updated!